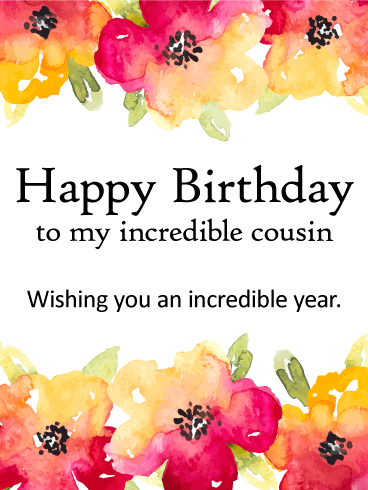 Featuring a frame of beautiful watercolor flowers, this heart warming birthday card is wonderful way to wish your cousin a year filled with love, light and laughter! 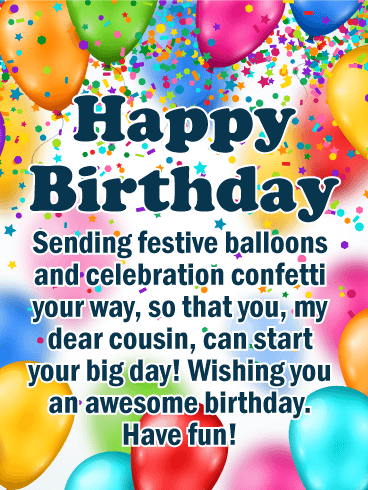 Whether you've been friends forever, or have grown closer as adults, she'll be so touched that you took the time to send your best wishes on such an important day in her life. 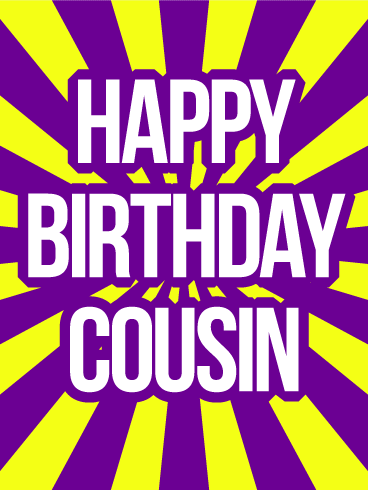 Happy Birthday to my incredible cousin - Wishing you an incredible year. You know that one cousin who always has a smile on their face, who plans every get together and who manages to make time for everyone? 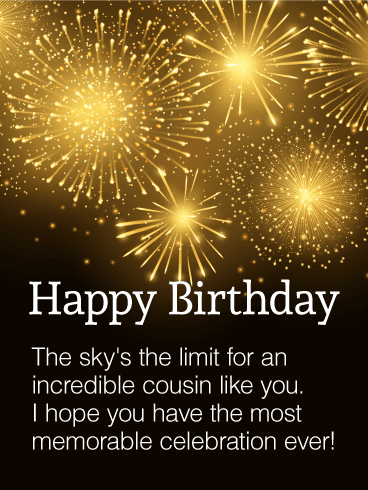 Show them how much they mean to you by sending along an extra special birthday card on their birthday! 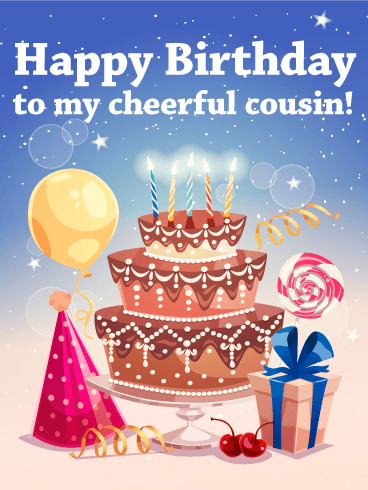 Presents, party decorations and the sweetest candle-topped cake set the festive tone on this wonderful greeting for the most "cheerful" person in your family! 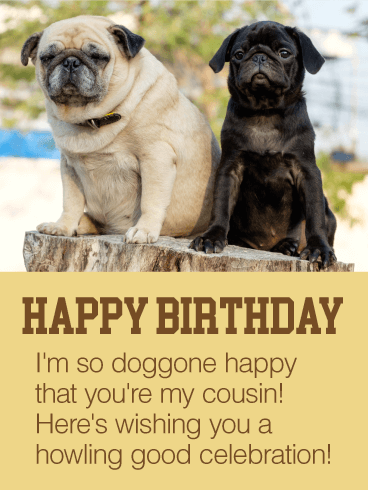 This adorable pair of pooches is here to help wish your very special cousin a very happy birthday! The two pals sit perched next to each other, just like best friends do. 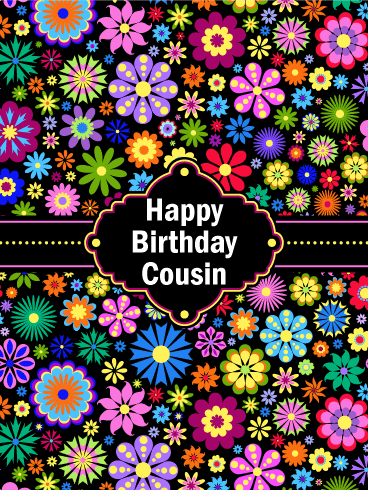 And the message is just as fun: "I'm so doggone happy that you're my cousin!" No matter what age they're turning, they're bound to "howl" with delight, especially because they know you took the time to remember them. 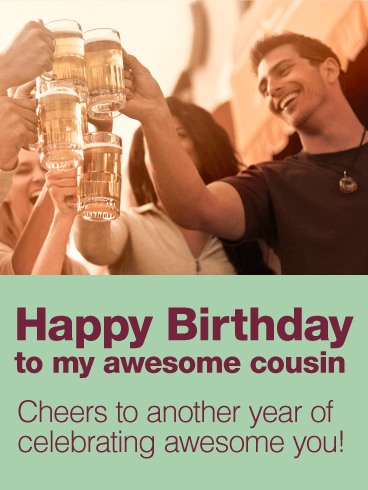 Raise a toast to the awesome cousin in your life with this fun-filled birthday card! Perfect for milestone birthdays (21, 30, 40), it's the perfect way to fill them with the party spirit as they welcome another year surrounded by all the people who make life worth celebrating! 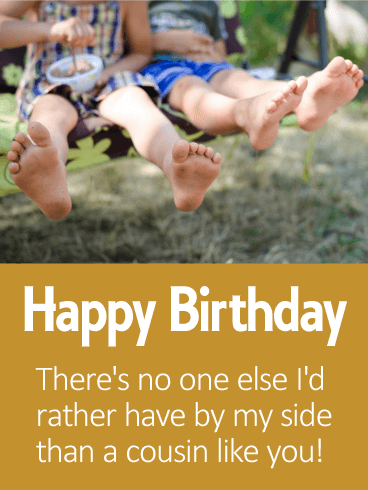 This sentimental birthday card, with two carefree kids swinging side by side, will fill your cousin with warm memories of growing up together, sharing so many wonderful moments along the way. 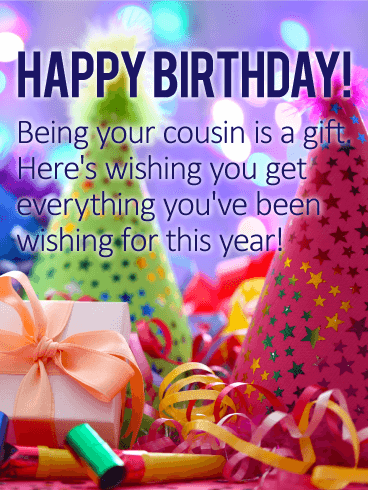 Celebrate their birthday with these touching words, which will remind them how much you cherish your unbreakable bond and how grateful you are to still be as close today. 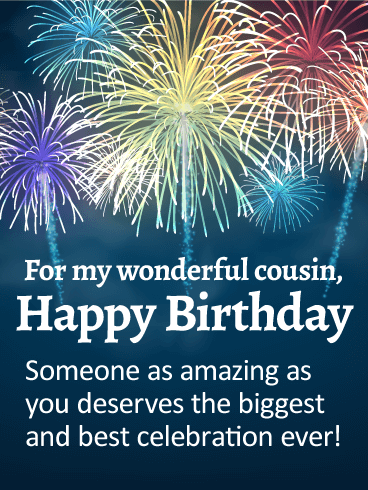 Colorful fireworks bursting in the background will let your cousin know that their birthday should be celebrated in "the biggest and best" way possible, while reminding them to enjoy each and every moment. What a wonderful way to make someone so special feel so loved as they turn another year older! 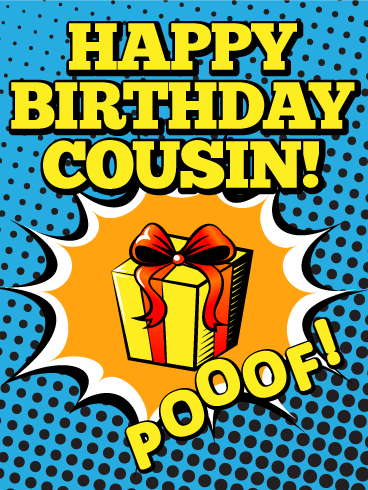 Party hats, party favors and plenty of presents are what every birthday should be made of...especially when it's for a special cousin like yours! Because after all, they're more than just family to you, they're someone you're proud to call a friend. 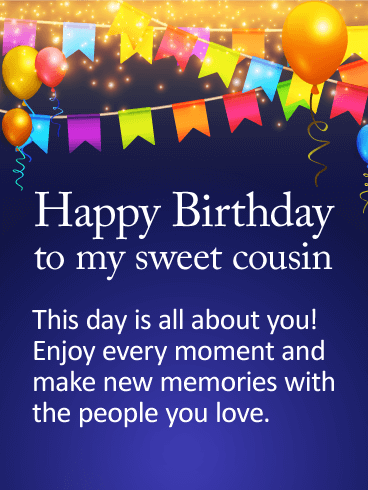 And each day you get to spend with them is a gift, which is exactly what this sentimental birthday card helps to convey.